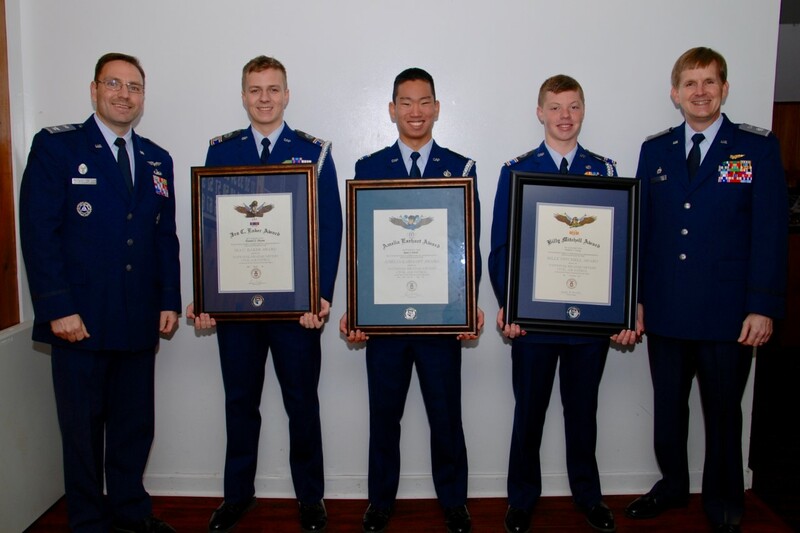 12/20/2017–WAXHAW, NC–Three cadets from the Composite Squadron of the Waxhaws were recently recognized at an awards ceremony at the Waxhaw American Legion Post 208 for achieving three major CAP cadet program milestones. The awards were presented to C/Lt Col Daniel Payne (Eaker Award), C/Maj Ryan David (Earhart Award) and C/2d Lt Andrew Young (Mitchell Award). The General Ira C. Eaker Award, the Amelia Earhart Award and the Billy Mitchell Award are three of the five milestone awards cadets earn as they progress in the CAP cadet program. More than 50 of their fellow squadron members, friends and family watched as each cadet's achievement certificate and their new rank were presented by North Carolina Wing Commander Col R. Jason Bailey. The General Ira C. Eaker Award is earned by a cadet for completing all 16 achievements of the cadet program and earning the grade of Cadet Lieutenant Colonel. This award honors the late Air Force General Ira C. Eaker - aviation pioneer, career military officer and one of the chief architects and visionaries of the U.S. Air Force. Less than 1 percent of all cadets earn the Eaker award and on average only 200 cadets earn this award in a year. C/Lt Col Daniel Payne, a student at Letourneau University, joined the Composite Squadron of the Waxhaws in September of 2012 and is studying engineering. The Amelia Earhart Award is the third of five milestone awards that CAP cadets can earn. Named for the groundbreaking aviation pioneer, cadets who earn the award must live up to Earhart’s standards of excellence and earn the grade of Cadet Captain. Achievement of this milestone award requires successful completion of leadership and aerospace exams, a rigorous physical fitness test and demonstration of leadership abilities including principles of officer-ship and the responsibilities of command. Approximately 5 percent of cadets nationwide earn the Amelia Earhart Award. 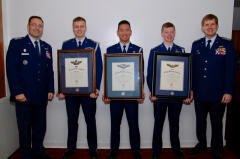 C/Maj Ryan David, a student at Central Academy, joined the Composite Squadron of the Waxhaws in November of 2014 and is a U.S. Air Force Academy nominee. The Mitchell award is awarded when cadets graduate from the enlisted ranks and take on greater responsibilities as cadet officers and earn the grade of Cadet Second Lieutenant. Cadets who earn the Mitchell Award have completed Phase 2 of the CAP Cadet Program, earning half of the 16 achievements required in order to receive the Spaatz Award — the highest rank and ultimate goal for cadets in CAP. To earn the Mitchell Award, cadets must pass comprehensive leadership and aerospace exams as well as a rigorous physical fitness test, attend an encampment and demonstrate leadership skills by leading the cadet squadron. The Mitchell Award was named after General Billy Mitchell, one of the most influential figures in the history of airpower. C/2d Lt Andrew Young, a student at Union Academy, has been a member of the Composite Squadron of the Waxhaws since April of 2014, and plans to attend the U.S. Air Force Academy.